Somehow, we were fortunate to be able to convince our 3-year-old dog to start using a dog crate — out of the blue. For 2-1/2 years, he had slept on our bed. Six months ago, we broke him of that. 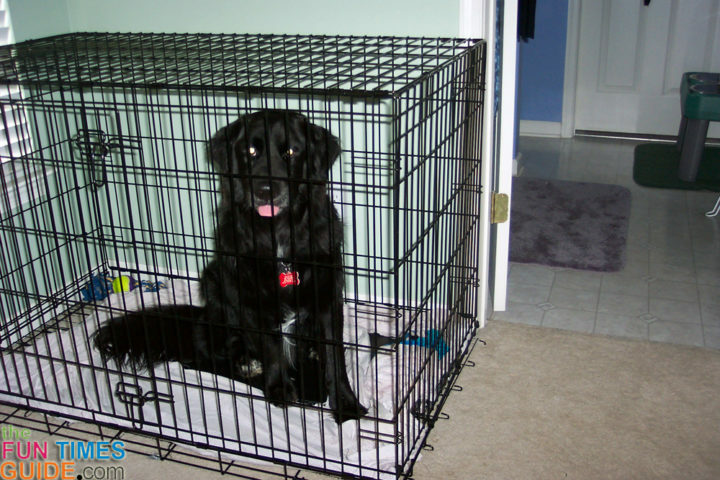 This week, we decided to try crate training our adult dog. Amazingly, our 3-year-old Black Lab-Golden Retriever mix barely balked at the fact that he had to stay in a crate for 6 hours on that very first day we introduced it to him. A) His younger brother has been in a crate through his entire 6 months of life. Maybe he was jealous and happy to finally have his own space too. B) He’s been bearing a lot of responsibility dog-pack wise — going from the “baby” (in a household of 2 dogs), to the middle dog (in a household of 3 dogs when we brought home a new puppy), to then the Alpha dog (in a household of 2 dogs when our eldest dog passed on) — all within a couple short months’ time. Maybe, he’s just happy to NOT have to be in charge for a change and he enjoys sitting back and relaxing in his comfy “crib” for Big Dawgs. C) He’s part Black Lab, part Golden Retriever (probably more the personality of the Golden Retriever — very laid back and regal in his demeanor) and those dogs tend to be more accepting than most breeds to changes such as this. True, he’s very easy-going in general, but we were certain that we’d have to spend a few days persuading him to just go inside the crate on his own, let alone stay in there for hours at a time! 1. The morning we brought the crate home, we set it up in our bedroom (next to his younger brother’s crate, but not touching it). 2. We filled a Kong toy with cooked chicken strips (grilled, from leftover Chicken Quesadillas) and put him in the crate with that. While we didn’t close the door, we didn’t let him leave the crate with that Kong (which he very badly wanted… especially since he doesn’t get “people food” very often). 3. After he finished the Kong, we let him leave the crate on his own free will. 7. We didn’t walk on eggshells around him in that crate. Jim came in the room a couple hours after I’d gone to sleep and we were talking, and Destin watched our every move, but he never whined to be let out of the crate. 8. It wasn’t until our normal morning wake-up time that he whimpered that he needed to go outside. This released him from crate-duty for the rest of the day. We continued to go through a couple of short-term crate stays — with a favorite food or toy in the crate with him and with us in the house in case he started putting up a fuss. For his first 2-1/2 years of life, he was allowed to sleep on our bed with us. That was, until we learned how badly this confuses dogs with regard to who’s “in control”. So, we stopped that about 6 months ago. For some reason, that too was a breeze. Destin never “tested” us with getting up on the bed after that first day that we disallowed it. We never dreamed it would be such a breeze to get him used to being locked inside a dog crate though. It’s a fact, dogs want (and need!) their own personal territory in order to feel safe and secure …and to fulfill their innate need to “den”. Dogs also need a place to just “chill out” on occasion. After one week of smooth sailing with Destin in the crate, all heck broke loose the first time we left him for 4 hours straight. From there, we faced an uphill battle in crate training Destin. But, we stuck with it and now both of our dogs have successfully been crate trained! Here’s how we eventually achieved success.